Dorothy Hughes was a writer for whom I have nothing but the utmost respect. Ride the Pink Horse is the third novel of hers that I've read, following The Expendable Man and In a Lonely Place, and quite frankly, she's never failed to wow me. She is probably best remembered for her In a Lonely Place, since it went on to become a major film starring Humphrey Bogart, and I think that that book tends to eclipse her other work, which is a shame, especially in this case. 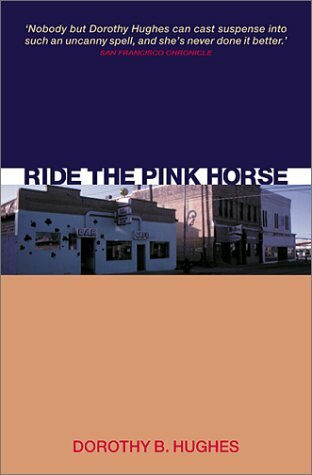 Ride the Pink Horse is one of the most intense books I've read recently, and while the plot is very simple, the book as a whole is definitely not. Like Patricia Highsmith would do a few years later in her first book, Hughes manages to get us inside the head of her main character and keep us there for the duration. No matter how much we may want out, it ain't happenin' until the last page is turned. The main character here, Sailor, has come from Chicago to what he calls a "hick town" along with his fellow bus passengers who he refers to as "yokels," "hayseeds" and "sheep." He's here on a mission: his old boss he calls the Sen, aka "the dirty, double-crossing, lying whoring Senator Willis Douglas," had set up his wife's murder, a guy was arrested and convicted by the Sen's testimony, and was then killed himself. There are only two people who know what really happened to the Sen's wife, and Sailor, who is the other one, had been paid off. The problem is that Sailor was given only a third of what he was owed, so now he's come to collect the rest. He's tired, a mess in rumpled clothes after traveling forever, and when he hits the streets, he comes face to face with his first dilemma: there is nowhere to stay in the town because it's the time of Fiesta. After being told repeatedly at hotel after hotel that there are no rooms, he is forced to count on a low-end hotel "next door to a pool hall," where he was sure they'd take him in. Again -- nothing available. As he walks toward the La Fonda Hotel where the Sen is staying, he's a "ashamed" to ask for a room, since "it was class," and "He wasn't class." His anger grows -- he blames his bad luck on the Sen, resentful and envious that he was "Playing it big, fine clothes, fine car, fine hotels, society blondes." The money he'd get from the Sen would help him start a life where he would be somebody and "live like a prince," -- the plan is to set up his own business in Mexico and "get himself a silver blonde with clean eyes." In fact, knowing that the Sen got a $50,000 payout from his wife's life insurance, Sailor decides that he'll demand more money, and figures the Sen can't refuse. Vowing not to be put off any longer, he plans on doing his business and getting out of this town the next day. Of course, since this is a noir novel, it's not going to be that simple -- and things begin to get complicated when Sailor discovers that the Chicago cop in charge of the Senator's wife's killing is also in town. While the plot seems simple, the book is actually quite complex. I could seriously talk to anyone about this novel for hours just because there's so much here. Sailor is used to being wronged, used to having doors slam in his face, used to taking a back seat to others, and this has caused to him to become a hateful, spiteful person. His hate extends from people of "class" to people he thinks are beneath him -- the "spics" for example, as he labels the Mexicans who have come to the town for Fiesta. However, he is surprised to find that these people are the only ones in the entire town who actually show him a modicum of kindness. He strikes up an acquaintance with a Mexican man whom he calls "Pancho Villa," who runs the old merry-go-round with the pink horse. Pancho offers him a place to sleep, companionship and other help. Sailor also meets a young Native American girl called Pila, who reminds him of his own past and he does what he can to help her maintain her innocence and her childhood. "alien land, of darkness and silence, of strange tongues and a stranger people, of unfamiliar smells, even the cool-of-night smell unfamiliar"
"The panic of loneness; of himself the stranger although he was himself unchanged, the creeping loss of identity." But first he has to collect from the Sen and deal with the cop MacIntyre, a man Sailor actually respects, but when it comes to giving Sailor advice, he isn't in the mood to hear it. The Sen, MacIntyre and Sailor eventually find themselves the players in what will be a three-way game of "cat and mouse" , where only one of them can come out the winner. The titular pink horse, as I said comes from the merry-go-round -- which is a great metaphor for Sailor's life and the future he so desperately wants. How that is I'll leave to others to discover, but to reiterate, this is definitely NOT a book where plot takes center stage. It is not a full on action-packed thriller, and it moves a bit slowly because Hughes invests her time in her people rather than just focusing on crime -- just my kind of book. There are a lot of racial slurs in this book, so beware -- it's very ugly, but then again, I just sort of accept that writers of the 1940s didn't write with modern sensibilities in mind. 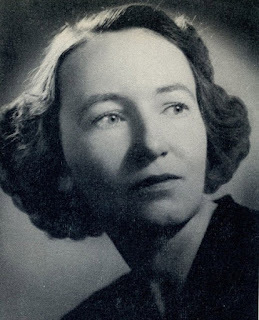 Hughes is an excellent writer, and in my opinion, she holds her own against any male author of the time, making it a complete shame that she is not more widely read or appreciated. 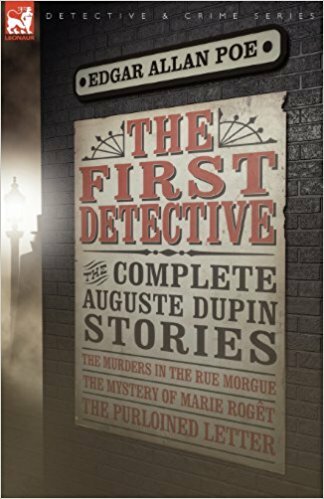 For readers of vintage fiction written by women, it is an absolute must; I also recommend it for readers of classic noir. I loved this book. "What do you do when you're standing in front of a painting? 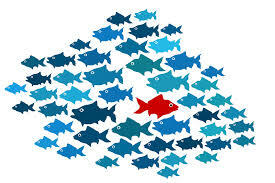 You adopt different positions until you get the best perspective." Originally published in 1955, Death Going Down begins with Pancho Soler's return to his apartment building on Calle Santa Fe in Buenos Aires in the wee hours of the morning -- at two o'clock to be precise. He's a bit smashed, nauseous, and unsteady on his feet, but all of that changes when he sees that there's a dead woman in the elevator. Now he's alert and really shook up. Luckily he doesn't have to face it alone -- just moments after his gruesome discovery, he is joined by another tenant arriving home, a Doctor Adolfo Luchter. Luchter realizes that the police will have to be called in, and that the victim seems to have been poisoned. Thus begins the investigation, but it won't be easy for the detectives to unravel this one -- with six floors of occupants, there are certainly plenty of suspects from which to choose. The investigators certainly have their work cut out for them, since the apartment building houses a number of people who harbor a variety of secrets that they are reluctant to divulge. Yet, as Inspector Ericourt notes, "There is always a truth, even if it's hidden." His task is to find it. While Death Going Down works along the lines of a police procedural/detective novel, it is neither a cut-and-dried nor a routine detective story. After finishing it, I have to say I was surprised not only at the identity of the murderer but also at the assumptions I made as a reader while following the case. When I turned the last page, it dawned on me just how very clever the author had been here precisely in how she used reader expectations while developing this story. The book is well worth reading for several reasons (including the fact that the apartment building is home to a number of European refugees from World War II - very nice move), but for me it was all about the fact that I was completely caught off guard while expecting one thing and ending up with something completely different. Sorry to sound so cryptic, but I really don't want to divulge anything. The story moves a bit slowly and may not be for readers who like fast-paced crime; it's really not cozy material, and it's not at all your average police procedural. However, it's quite good, nicely done, and as I said, the solution threw me for a loop. Suffice it to say that any author who can do this in a whodunit earns my great respect, since I've been reading mystery/crime novels since I was about five. 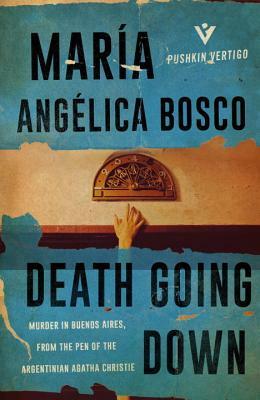 From the back-cover blurb I learned that María Angélica Bosco was known in her day as "the Argentinian Agatha Christie," but I have to say that her writing style (at least as evidenced here) is most definitely her own. Readers of translated crime fiction really do not want to pass this one by.